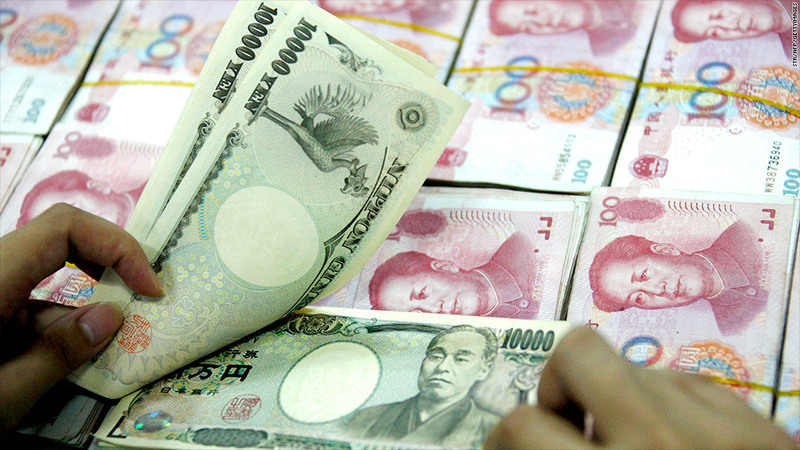 Trading in the Chinese yuan has picked up significantly in recent years. The Chinese yuan was the ninth most traded currency in the world in the most recent ranking by the Bank for International Settlements, the first time the currency has broken into the top 10. The Chinese government has traditionally worked to keep the currency pegged to the dollar as a way of promoting manufacturing in its export-driven economy. That has prompted charges by critics that it is involved in currency manipulation. Pressure from other nations has led the Chinese government to allow more movement in the value of the yuan in recent years, which in turn has increased the trading activity. The currency was involved in 2.2% of foreign exchange trading worldwide in April, the period examined by this week's report. That's more than twice the share of the foreign exchange trading it participated in April 2010. The dollar was involved in 87% of all trades, the euro was part of 33% of trades, and the Japanese yuan was involved in 23%. But while the dollar and yuan both gained in their share of the foreign exchange market, trading in the euro was down significantly from 39% of all trades in 2010. The lessening of worries about European sovereign debt resulted in the declining trade to the lowest share since the European common currency was introduced. The amount of foreign exchange trading increased to $5.3 trillion per day in 2013, up from $4 trillion in 2010.